© Wong Maye-E/AP Sen. John McCain, R-Ariz., greets the audience as he arrives to deliver a speech in Singapore in 2016. Sen. John McCain had been dead only a few hours before hard-line critics in his own party began to pounce. “Faux conservative,” added another supporter of President Trump. The torrent of outrage came in response to a Saturday evening post on Instagram from Lynne Patton, a longtime associate of the Trump family working in the administration, who had taken to social media to praise McCain. The angry replies to her heartfelt statement reflected not just disagreement but a sense of betrayal that cuts to the core of America’s deeply polarized politics. Today partisanship has a “stronger influence” on voters’ behavior that at any time since the 1950s, Alan Abramowitz and Steven Webster, two Emory University political scientists, wrote recently. One result: Any act of compromise with the enemy — or opposition party — is greeted with anger and derision. “Dislike of the opposing party, its supporters and its governing elite is a powerful mechanism driving individuals to remain consistently loyal to their own party,” the two political scientists wrote. This anger is likely “to shape voting behavior well into the future,” they concluded. The phenomenon appears to account for much of the animosity toward McCain, particularly among Republicans. Even though he was a reliable Republican vote, he often called for compromise with Democrats on key issues such as immigration and health-care legislation. He was hit regularly with the one of the worst monikers in factional politics: that he was a “RINO” — a Republican in name only. Neither increased partisanship nor angry derision of those on the opposing side began with Trump, although he has both fueled and benefited from both. National polls confirm that Trump supporters had soured on McCain in the months and years before his death. A Fox News survey released last week showed that 52 percent of all registered voters had a favorable view of McCain, significantly higher than they had of Trump. But those figures were buoyed by Democrats, 60 percent of whom viewed McCain favorably. Among Republicans, the overwhelming majority of whom support Trump, the number was far lower: Only 41 percent of Republicans had a positive view of the senator, who was then still fighting for his life. In the final years of his life McCain railed against this disturbing trend in American politics as forcefully as anyone. On three major occasions, two speeches delivered in the last year of his life and a statement issued posthumously Monday, McCain spoke in favor of modesty, bipartisanship and compromise. “We often argued — sometimes passionately — but we believed in each other’s patriotism and the sincerity of each other’s convictions,” McCain said of Biden. After casting the deciding vote last year against the repeal of the Affordable Care Act’s individual mandate, McCain described Senate debates as “more partisan” and “more tribal” that at any time during his long Washington career. McCain’s final message in support of comity and compromise came Monday in a farewell statement. In it, he also none-too-subtly repudiated Trump. “We weaken our greatness when we confuse our patriotism with tribal rivalries that have sown resentment and hatred and violence in all corners of the globe,” he wrote. McCain’s longtime staffers in Arizona offered varied explanations for McCain’s unpopularity with his own party and the partisan drift of American politics. Some blamed the proliferation of Internet media outlets, which elevate the loudest and most outraged voices. Other McCain partisans blamed Trump, who has remade the Republican Party in his pugilistic image. Trump’s overwhelming popularity among Republicans has increased the demand for party members — even elected ones — to fall into line. But McCain has bucked in the opposite direction on some issues, such as the efficacy of torture. 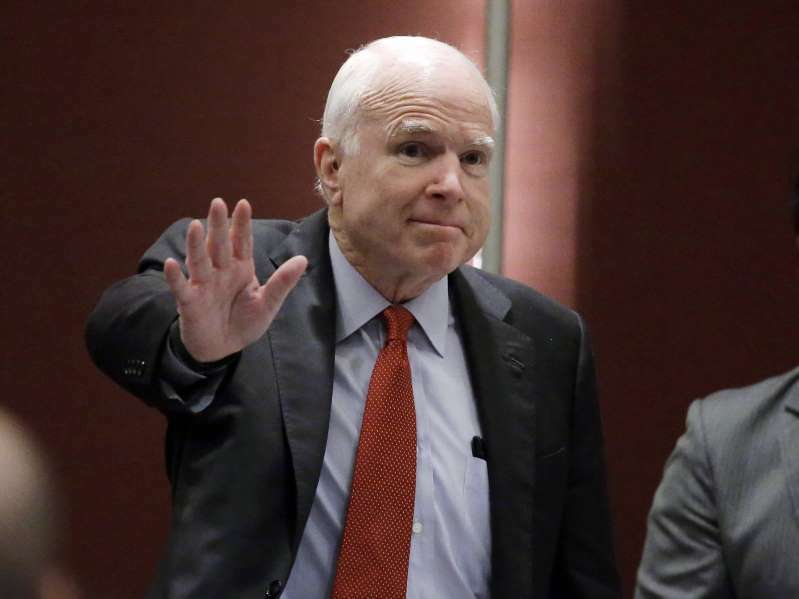 “I remember going to district meetings and having to explain John McCain the maverick to angry conservatives who would rather lose and not get anything done than make progress,” said Wes Gullett, McCain’s former state director in Arizona. Today those forces in the Republican Party have united behind Trump. “It’s a cult of personality,” Gullett said of the party. On Sunday, Patton returned to Instagram to explain her praise for McCain. Her first post ran only 30 words. The second ran nearly 400 words and focused on McCain’s many faults. “Even my most liberal friends have turned longtime Republican, #JohnMcCain, into a deity and ‘American Treasure,’ simply because they hate Donald Trump,” she wrote. For a brief moment Monday Trump seemed to hear him, reversing an earlier and much criticized decision not to keep American flags on federal buildings at half-staff to honor McCain. Trump seldom admits mistakes, and he would not go that far Monday. “Despite our differences on policy and politics, I respect Senator John McCain’s service to our country, and in his honor, have signed a proclamation to fly the flag of the United States at half-staff until the day of his internment,” a statement from Trump read. In death, at least, it seemed as if John McCain got the last word.